Where is the dividing line between indoors and outdoors? When you are looking at LISI, Team Austria’s building at the Solar Decathlon, this is very hard to say. The main architectural idea of the building is the seamless connction between the spacious living room and the patios in the north and south of the building. When the weather is nice, the glass front on either side can vanish into the wall and a partly roofed living space is created, which is about twice as large as the interior alone. The floor plan is quite simple: LISI was designed in such a way that the open area for living, cooking and dining is as large as possible. Bathroom, bedroom and the engineering room on the other hand are rather small. LISI is almost entirely made of wood. Therefore it is fitting that also the architectural concept is inspired by trees: Much like the trunk of a tree, which transports water and provides structural stability, the module consisting of the bathroom, the bedroom and the engineering room forms the core of the house and is rooted in the wooden groundwork. The structural elements of the exterior wall define the visible form of the house, similar to the large branches of a tree. 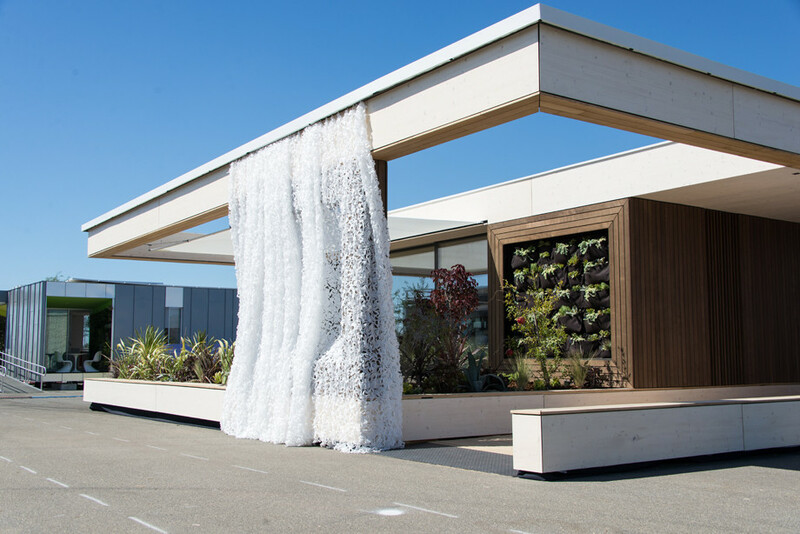 Instead of leaves, LISI has white wavy curtains made of a robust, weather-proof material. They can be drawn to create a private space, or they can be pushed aside to open the house up.